Sicily, an Italian island, is the largest in the Mediterranean Sea, jutting off the ‘toe’ of the nation’s ‘boot’, encompassing one of the country's twenty regions. 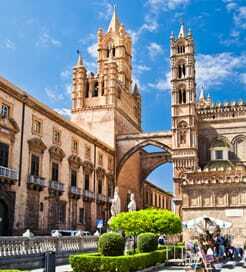 A crossroad throughout history for Mediterranean cultures, Sicily has long captivated visitors with its rich heritage and bountiful ancient structures. A sizeable chunk of the European history books has focussed on Sicily, culminating in the numerous attractions we admire today: seven Doric-style Greek temples, beautiful Byzantine mosaics, Arab domes and arches in Palermo, and ruinous Norman castles scattered throughout the island. In fact, walking through Sicily feels like an open-air museum; it’s worth noting, however, Sicilian temperatures truly soar during the summer, so it’s best to visit during the shoulder months. With a landscape as varied as the culture, Sicily satisfies both historians and nature-lovers in equal measure. Commanding the island is Mount Etna, the tallest active volcano in Europe, within the city of Catania, offering skiing during winter and excellent hiking in summer. More idyllic backdrops can be found along the coastline: pristine beaches, offshore islets with crystalline waters, and picturesque bays, most notably the Golfo di Castellamere. The salt flats in Trapani also make for fascinating viewing, as does the world’s largest astronomical clock in the Museum of Messina. Living within an autonomous region of Italy, the inhabitants are a proud people, speaking in Sicilian and serving an exotic cuisine utilising a few fundamental, island-grown ingredients with dashes of Spanish and Arabic flavours. A typical local shopping list would include citrus fruits, shellfish, pistachios and almonds, while the most popular seafood dishes normally contain tuna and swordfish. Moreover, Italy’s finest dessert-makers usually hail from Sicily, and their most well-known export, cannoli, is loved the world over. Sailing to Sicily by ferry is a popular choice for most visitors, given its proximity to many Mediterranean destinations and large selection of ports around the entire coast, allowing you to visit all the main cities with ease. The majority of routes are from cities on the west coast of Italy and surrounding offshore archipelagos and islets, while regular international crossings are also available from North Africa and Malta. For more information, please visit our Ferries from Aeolian Islands to Sicily page. For more information, please visit our Ferries from Sardinia to Sicily page. For more information, please visit our Ferries from Rome to Sicily page. For more information, please visit our Ferries from Aegadian Islands to Sicily page. For more information, please visit our Ferries from Pelagie Islands to Sicily page. For more information, please visit our Ferries from France to Sicily page. For more information, please visit our Ferries from Pantelleria Island to Sicily page. For more information, please visit our Ferries from Tunisia to Sicily page. For more information, please visit our Ferries from Ustica Island to Sicily page.